Rowland John Robb Langmaid R.A. 1897 – 1956) British Seaman, engraver, artist and war artist. 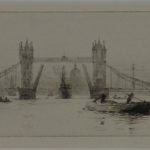 Rowland Langmaid was born in to a Navy family in Vancouver and he studied maritime art with William Lionel Wyllie. He himself joined the Royal Navy in 1910 and trained on the Isle of Wight. 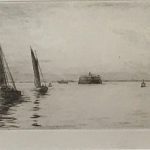 His artistic abilities led to him sketching landings in the Dardanelles where he served aboard the battleship HMS Agamemnon. 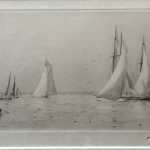 He retired in 1922 to paint. He returned to his studies at the Royal Academy School and the Royal College of Art. He enjoyed some popularity and staged exhibitions in London, New York and Paris.